Pho ga lovingly made by my mom and aunt. Mature chickens stewed for hours. Fresh chicken poached, cut into pieces, and marinated with a bit of fish sauce. Thinly sliced chicken skin, freed from any chicken fat. Rich, savory slices of chicken liver. Rice noodles just made from the factory this morning. The house perfumed by the aroma of chicken broth. 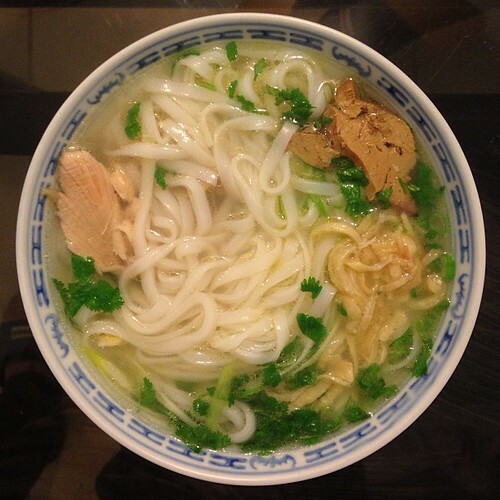 The incomparable first spoonful of slippery noodles, hot soup, and a bright kick of a single bit of scallion. Nothing beats homemade when homemade tastes like that. Do you like chewy, slippery goodness? What about the savory taste of ground pork or shrimp? And the pungent room-temperature funk of fish sauce? If you, like me, answered yes to all of the above, then you might find yourself enjoying warm plate of banh cuon from Banh Cuon Tay Ho. The old neighborhood staple may be hard to find because it’s tucked into a strip mall that doesn’t exactly face the street. In fact, it’s so hard to find that I forgot completely about it for years until it recently popped back into my mind like some repressed memory. I remembered my mom buying plastic boxes of banh cuon from them, packed full of the slippery white sheets, warm bean sprouts, and crispy sweet potato fritters. This place was frying sweet potatoes long before sweet potato fries was a thing. My go-to plate right now is 6A, which is banh cuon filled with ground shrimp. It also comes with a couple pieces of shrimp paste (think shrimp-flavored meatballs), and a healthy handful of par-boiled bean sprouts and julienned cucumber. My old favorite was the banh cuon dac biet (the special) which comes with ground pork instead of shrimp. For a few dollars more, you can also get the sweet potato fritters, a deliciously mysterious deep fried mung bean ball, and slices of cha lua (or what I like to refer to as Vietnamese ham). Once the plate of your choice is placed before you, there are two forms of attack. If you’re ravenous and don’t mind your food mixing together, you can ladle the fish sauce from the Kool-aid sized pitchers on the table into a small bowl, adding enough chili sauce to your liking, and then pouring it over your entire plate. Mix well and you have a tasty and nutritious salad thing. The second form of attack, which a refined lady like me uses, is to ladle the sauce into a bowl, throw in a handful of bean sprouts and cucumber, and dip individual pieces of banh cuon in there, picking up some sauce-soaked bean sprouts and cucumber on the way. When I’m feeling extra fancy with my chopsticks, I spread out a piece of banh cuon, dip some bean sprouts and cucumber in the sauce, put it on said banh cuon, and with my chop sticks, fold it up into a taco and eat it that way. If you’re unsteady with the chopsticks, leave that maneuver for the pros. Realistically, any plan of attack that ends up with the banh cuon in your mouth is a successful one. 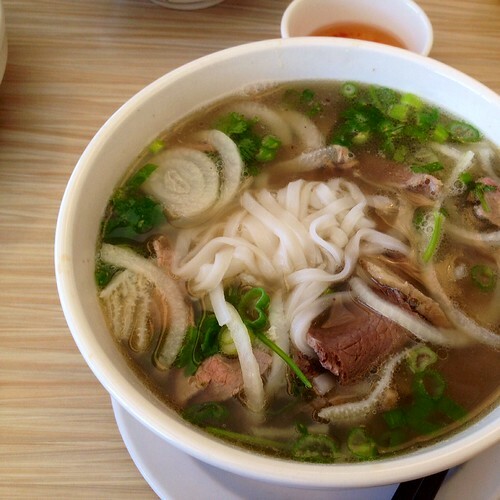 There’s something satisfying about putting those warm, freshly-made rice-noodle-things into your mouth. And when it’s coated in salty, sweet, garlicky fish sauce, it’s even better. The sides are nothing to be scoffed at either. The shrimp paste is deep fried to give a sufficient chew to the outside while still being tender and soft on the inside. The sweet potato fritters have an unnatural ability to stay crispy, even after dunking in the fish sauce. The mung bean ball thing makes me think of space-food. And to wash it all down? The no-nonsense older guy who’s always there will probably ask you what drink you want. That’s the only sign of hospitality he’ll show you. After he takes your order, he’ll stand in the corner of the room and brood. Order the lemon soda if you want something refreshing. It’s one of those drinks that’s greater than the sum of its parts. Ice, soda, lemon, and a bit of salt and sugar may not sound good to you, but I never regret ordering it. Most Vietnamese places are no-man’s land for vegetarians and vegans. Not this one. 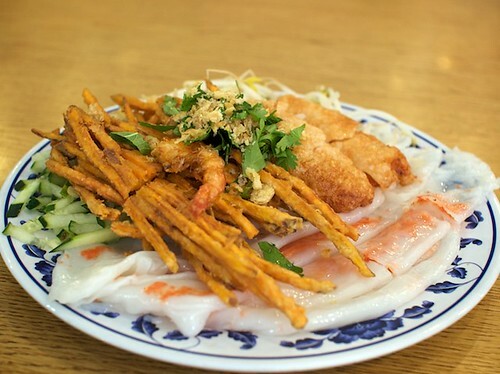 Banh Cuon Tay Ho has a whole page dedicated to vegetarian plates. An easy introduction to banh cuon for the vegetarian is probably their banh cuon with fried tofu. They’re empty rolled sheets of rice noodle topped with deep fried tofu sheet, cucumber, and other tasty vegetable-based morsels. 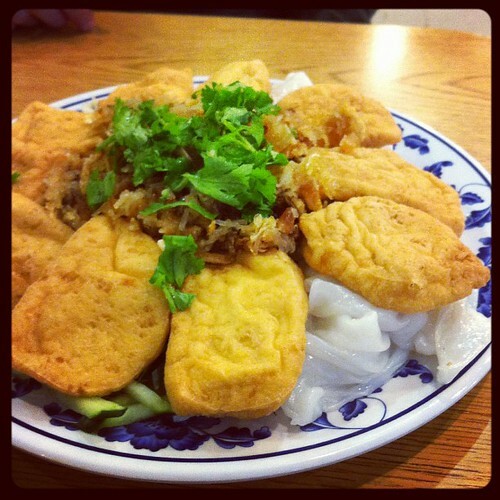 Instead of the cha lua, vegetarians are given curiously chewy deep-fried tofu. The vegetarian plates even come with their own vegetarian (fish-free!) bowl of sauce. 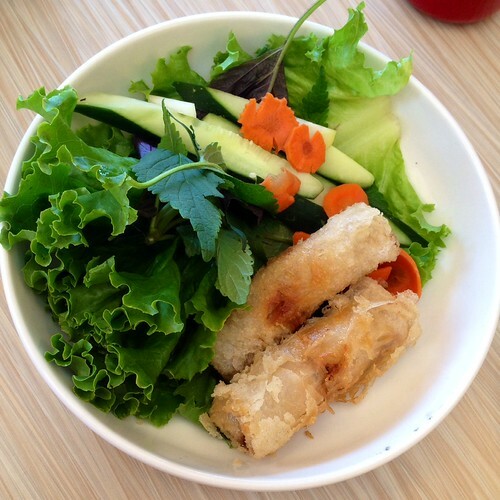 What more can an omnivore who’s married to a vegan ask for at a legit Vietnamese restaurant? In a place like the San Gabriel Valley where restaurants open and close with a blink of an eye, Banh Cuon Tay Ho must be doing something right since they’ve been open for more than ten years. And the thing they’re doing right is fresh, simple, banh cuon.